For live-lining large baits (bunker/pogies, porgies, herring, shad, etc.) for catching big striped bass on live bunker, we recommend a conventional rod and reel combo rated for 30-40lb mono. The optimal rod is a 6’6″ to 7′ rod with medium-fast to fast action and medium to medium heavy power. The rod needs to have enough backbone to pull the hook out of a large bait and into the mouth of the striped bass. This is a very versatile conventional outfit and is perfect for nearly all northeast live bait applications. The stretch ensures that the angler has a few extra moments to free-line the reel when the fish picks up a bait because of the stretch and belly in the line. The bigger fish can be very sensitive to quick to drop a bait that seems unnatural. Some of the biggest fish are found around structure and there is a very good chance the line will make contact. The monofilament line will get nicked or scuffed when braided line will simply break. Braided lines has very poor abrasion resistance. The rig is completed with a 8/0-9/0 offset octopus (beak) style hook with a turned-down eye. The turned down eye is particularly useful to complete a snell knot. See the video below on exactly how to create this very simple rig. When they are alot of blues around we switch to 80lb fluorocarbon leaders, but never to a wire leader. Wire leaders tend to greatly reduce the chance of a pickup and the 80lb leader is typically tough enough to get the blues to the boat for a quick release. The best hook placement for swimming live bunker is on the top of the bait just behind the dorsal. This will allow the angler to steer the bait and keep the bait in the hit zone when a fishing is chasing it. This method is best for very slow drifts or when anchored in shallow water with very little current or none). When drifting deep baits an egg sinker (typically 4oz or more) should be placed on the main line ahead of the swivel. The hook must be placed in the nose of the bunker. 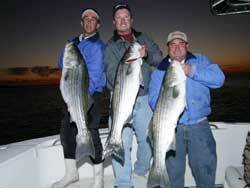 However, a very big hook set is needed to pull the hook out of the bait and into the striped bass. We typically use a 7 foot spinning outfit loaded with 30-50lb braided line. The thin diameter of the braided line allows use to easily cast an un-weighted 10/0 classic treble hook over a bunker school. We reel very slowly and when we feel a slight tick on the line we take a swing to set the hook. This works nearly every time. If we feel a lot of vibration in the line that suggests we have snagged the bunker well behind the head and will leave that bait in place to see if it gets picked up. Please contact us if you have questions about our recommendations! Click on any of the images or names to visit the manufacturer's website. Click on the links or retailer logo to see prices or purchase. If you can't find the product you want, try searching Amazon. Please contact us if you find any broken links! Custom USA hand-made bunker (menhaden/pogy) cast nets for serious and professional anglers designed and created by Charlie Kay.